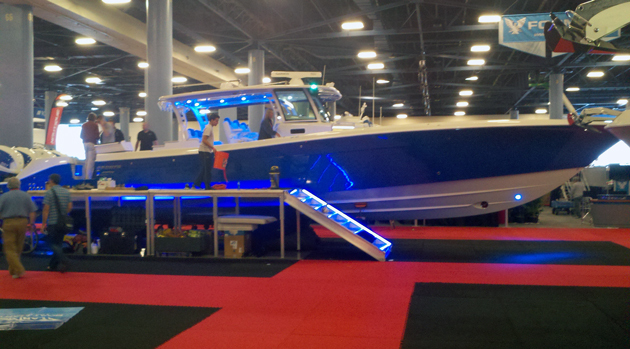 The Hydra-Sports 4200 SF is now available in the Siesta version. 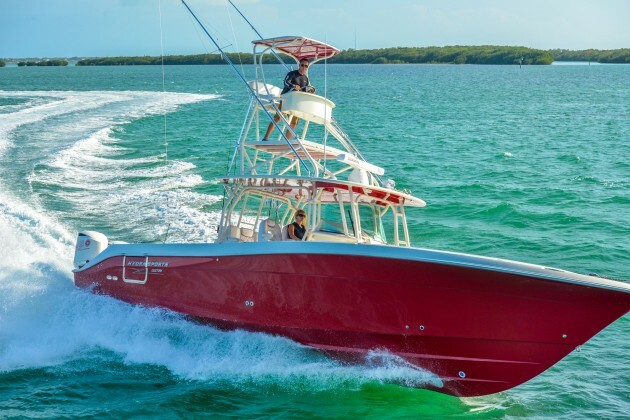 In our archives you'll find a review of this boat's earlier iteration, which was entitled Hydra-Sports 4200 SF: Maximum Power. We chose this title for a good reason: with 1,400 horses on the transom, 48 rodholders, seven fishboxes, and 90 gallons of combined lievwell capacity, this boat pretty much over-powers its competitors in every possible way. 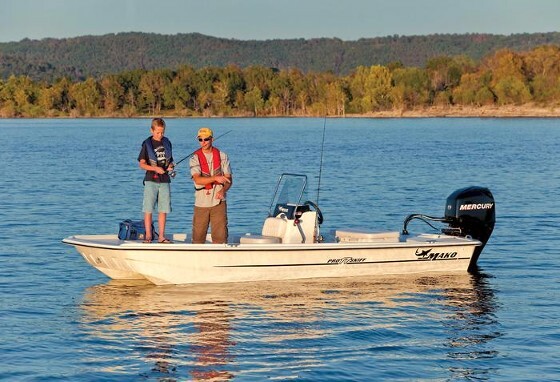 But that single-minded pursuit of power also limits the boat’s appeal to a certain sub-set of anglers. There are those who also desire comfort, convenience, and yes, a place to snooze when the bite’s slow. Hence, the new Siesta edition. 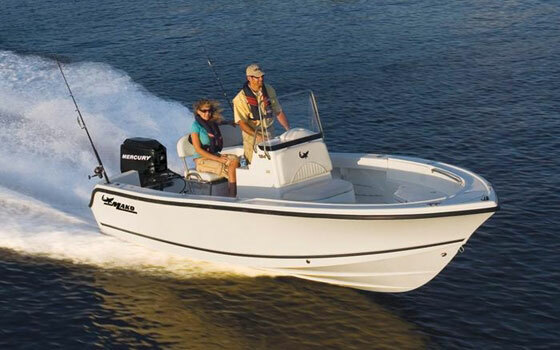 As you can see, the Hydra-Sports 4200 Siesta is still no slouch; they didn’t give up one iota of power, in gentrifying this fishing machine. 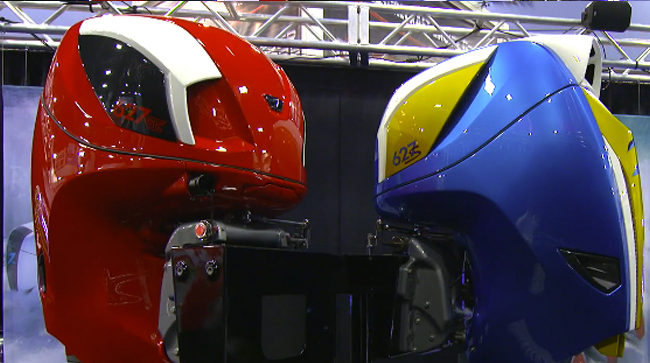 Yes, the 4200 Siesta still can carry quad V-8 outboards. In fact, its horsepower rating is stated as “No Max,” and I imagine the Hydra-Sports guys have a well-justified smirk on their faces when they say this to their competitors. Cram on as many outboards as you can, plan on a top-end busting through 65-mph and a cruise of over 50-mph, and laugh as you leave the pack in your wake. Just remember to trade in your sunglasses for a pair of goggles, or the lenses might blow out when you lean around the windshield. And yes, this boat is still designed purely for fishing. It has a monster cockpit, coaming bolsters lining the gunwales, and a leaning post tackle station to die for. In fact it’s one of the best on the water, with slide-out drawers on stainless-steel tracks, a sink and cutting boards, six vertical rodholders, a slide-out ice chest, and bulk stowage. Toe-rails line the aft cockpit, and you can add a fighting chair or battle station as you see fit. So, where the heck are you going to take that nap? You’ll see why the Siesta gets its name when you enter the console cabin, which is a true cabin, not just a head compartment. Sure, there’s a commode down there (which is prettied up by hiding it away beneath the seat at the base of the stairs), but there’s also a basic galley with a sink and microwave, a flat-screen TV on the bulkhead, two opening ports, and a berth that folds closed to keep the deck open, or swings down creating enough snoozing space for an intimate couple. Not a pair of sweaty, chum-covered anglers, mind you—this is a pretty tight space—but for weekend trips or overnighters at the canyons, it will definitely make life a bit more pleasant. Especially when you flip on the air conditioning. 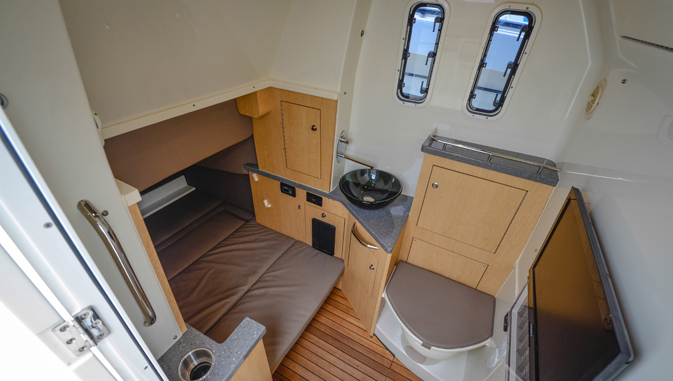 With a berth and a small galley, the Siesta version adds a bit of creature comfort to the 4200 SF. 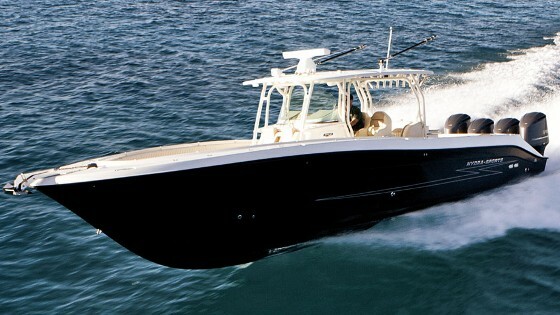 Truth be told, you can find center console cabins that are larger, more lavish, and have more sleeping space. But is that really why you buy a center console in the first place? Not likely. Ninety percent of your time is probably going to be spent out on deck, swinging rods and gaffs. Or, in this case, maybe just throwing down the throttles and blasting off to a different hotspot, simply because you can get there at warp speed. But if the urge strikes you to take a nap, it’s no problem on the Siesta. Test conditions: 1 foot chop, winds 5 - 10 knots, 2 POB. 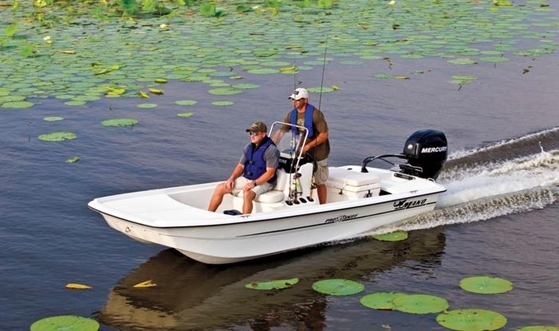 Power Quadruple F350 Yamaha four-stroke outboards, swinging 15.25" x 23" three-bladed SS props. Performance data courtesy of Yamaha. 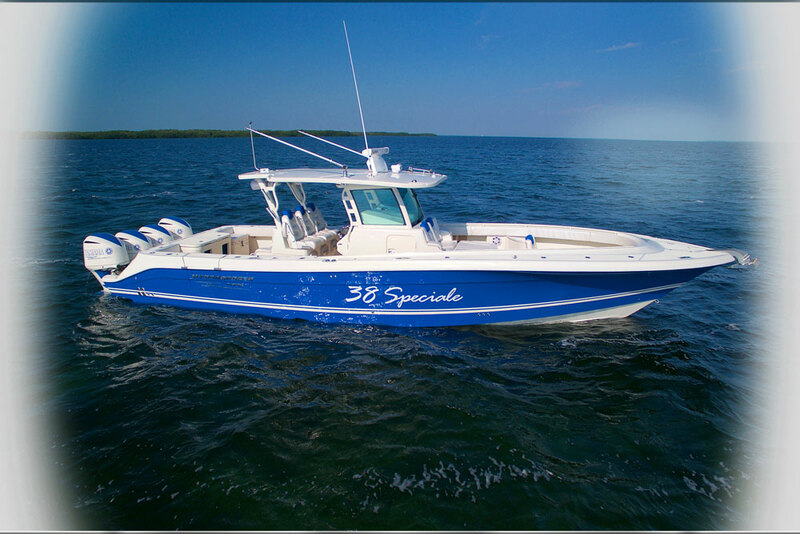 Other Choices: The Venture 39 is another monster-sized center console, and although it can only take three outboards on the transom, it can attain speeds in excess of 60-mph. Another quad-engine option is the Sea Vee 430 Fisharound, which turns the console into a much more substantial cabin with a full galley, dinette, and V-berth, but as a result has less deck space. 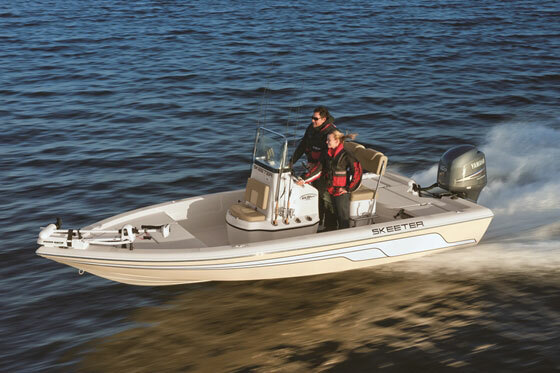 See Hydra-Sports 4200 SF listings. For more information, visit Hydra-Sports.